Why Choose DBS Inc. Electronic Assembly? Located within the central region of the U.S., our manufacturing facility offers competitive pricing while eliminating issues associated with offshore sourcing. Most commonly sited obstacles include protection of your intellectual property, poor customer service and lead times. DBS Incorporated utilizes state of the art equipment in your assembly manufacturing. We have built a wide range of products for numerous companies since 1989 and our customers range in size from start up to Fortune 100. This depth and diversity of our customer base enables us to stay on the leading edge of manufacturing. Avoid capital expenditures in equipment and inventory, thus freeing up capital to fuel growth. Improve cash flow and return on investment. Reduce market introduction lead time. Utilize and manage your time and efforts for core competencies. Expand your manufacturing engineering expertise. Relieve and balance your manufacturing loads. "Our Customer's products are our only business"
At DBS, quality begins in the planning stage of every program. 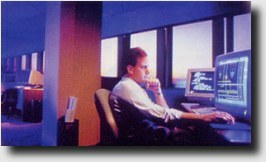 Requirements are analyzed and procedures are implemented to adhere to the unique standard set by each customer. 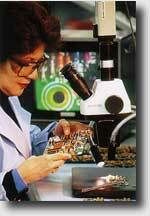 Quality control is emphasized from receiving through component testing, production, final testing, and shipping to insure delivery of defect-free products. We know your organization is zero defect manufacturing oriented; so is DBS. Since OUR CUSTOMER'S PRODUCTS ARE OUR ONLY BUSINESS, we build each product as if it were our own. The keys to quality at DBS are our people and the equipment. DBS has a full compliment of experienced contracting, purchasing, production planning, and quality control personnel dedicated to support the efficient, high quality, turnkey manufacturing of your products. Quality certification is also a top priority at DBS. We currently build to IPC Class II specifications and the customer's UL specifications. The DBS manufacturing facility consists of 10,000 square feet of modern production and office space. 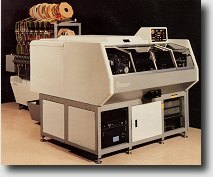 The production areas have been specially treated with a mil-spec, anti-stat surface compatible to those found at IBM, Xerox, etc. Sizable assembly line investments have focused on automation, optics and microprocessor controls. Brand new Universal insertion machines are the heart of our through-hole assembly with rates from 16,000 components per hour on the axial lead sequencer/inserters to 9,200 components per hour on the radial lead sequencer/inserters. The equipment comes with in-line sequencing which enables timely assembly by eliminating off-line component handling. A customer's bill of material is stored in the computer and can be downloaded to any machine at a moments notice. Each component inserted is tested by the expanded range verifier which provides on-line confirmation of component sequence, value, and polarity; thus assuring proper assembly. At the heart of our surface mount assembly is a Quad system. Designed for speed and flexibility, the system features a placement rate range up to 7,000 components per hour depending on board and component type. It handles components from 0402 to PLCC 48 and up to plastic lead chip carriers (PLCCs) measuring 2.2". 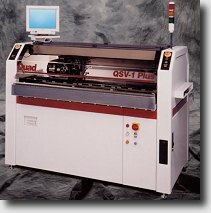 It centers components "on the fly" using a Laser Align Optical Component Centering System and can be configured to perform a variety of surface mount production tasks. The Laser Align systems provides accurate, non-contact component measurement between pickup and placement. Components are correctly centered at the designated placement location to within +.001". Up to six heads can be controlled by a single PC simultaneously, as an integrated surface mount production system. Consistent placement of 15 mil lead-spaced devices is standard.